With the Thanksgiving season just around the corner, families are beginning to think about what they are thankful for. They are also planning activities for Thanksgiving break, and Wichita should be at the top of the list. We at Visit Wichita have our own reasons to be thankful this season. Being the largest city in Kansas offers us the luxury to be able to share the holiday joy with visitors though an abundance of attractions, restaurants, shopping, sports and cultural experiences. With the variety in shopping centers, local boutiques and national retail stores, it’s no wonder many visitors head to Wichita to fulfill much of their Black Friday and Small Business Saturday needs. From the local feel of downtown Wichita’s collection of souvenir shops and gift stores to your nationally-known favorites in NewMarket Square and Bradley Fair, you’re sure to find the perfect gift for even the hardest person to shop for. Between The Spice Merchant & Company, Kernel’s Popcorn Express and Cero’s Candies, you can mix-and-match the perfect snack for those who love gourmet treats, flavored popcorn and chocolate delights. If you’re looking for one-of-a-kind items, try specialty shops like The Workroom, where you can get custom ICT flag swag embossed on just about any item imaginable to serve as the perfect Wichita souvenir; or, Urban Interiors by Farmhouse 5 for that unique décor to add spice to your home. The shopping options are endless. Check out more local and national retailers here. From escape rooms and brew wagon tours to the fast-pace of go-karts, rock climbing, Nerf guns and laser tag, Wichita has a huge variety of fun for the whole family. No matter your interest, there is an experience tailored just for you. Are you an adventure-seeker? Would you take on a nearly 40-ft.-tall wall or 15-ft. bouldering area to reign supreme against others trying to make it to the top? 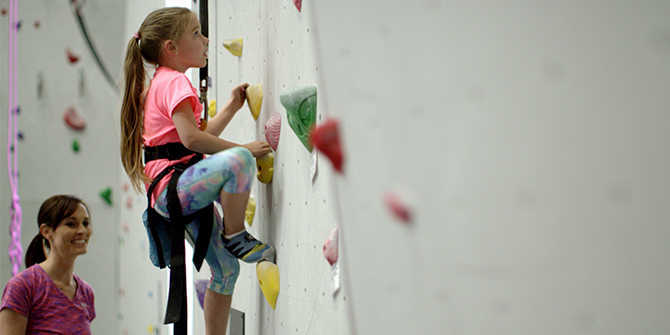 Bliss Climbing and Fitness is a full-blown gym equipped with workout equipment, climbing walls, bouldering areas, a yoga studio and gymnastic-inspired training devices. If you’re even more extreme, head to Xtreme Racing for the ride of your life. Hop on to an Italian go-kart and reach speeds up to 45 mph. Race your friends until your heart is content and then cool down with pool, foosball or video games. Do you need to expel some energy? Wichita has two different trampoline parks with multiple jump spots. At Urban Air Trampoline Park, try one of the six trampoline activity areas that include features like a foam pit and a slam-dunk court. You can also enjoy an indoor ropes course and a trampoline area designed especially for the little ones. Aviate Extreme Air Sports at the Wichita Sports Forum offers 20,000-sq.-ft. of extreme jump space. Families can bounce into large foam pits, run challenging obstacle courses, enjoy a slack line and trapeze and work on their air dunk skills. Plus, every Monday from 6-9 p.m. is Family Night. Are you the kind of person who loves riddles or cracking a good mystery? Check out Wichita Room Escape or Entrap Wichita Escape Room to test your skills. With a limited amount of time to solve puzzles and answer clues before time runs out, see how quickly you can escape. Still looking for more family fun? Take a look at all the things to do here in Wichita. It doesn’t matter what kind of food you’re craving, Wichita has an option for you. From authentic international cuisine to steaks and sweets, there are more than 200 restaurants in the downtown area alone. Plus, Wichita is big on its food trucks, and they pop up all over the place during local events. Try something unique like a secret homemade pickle recipe or gourmet pizza at Public at the Brickyard or enjoy a family-friendly sports bar at Bubba’s 33. Experience the tradition of street tacos at District Taqueria, or enjoy the freshest, lightest Mexican food in Wichita at Ruben’s Mexican Grill. You can never go wrong with BBQ and Wichita is home to some of the most delicious brisket, pulled pork and ribs in the country. Between Bite Me BBQ, Inc. being named one of Kansas’ “Top 7 BBQs for Ribs” by KANSAS! Magazine, the buffet-style dining experience of B & C Barbeque, and the amazing wood-smoked flavor of the Delano Barbeque Company, you can find your favorite flavor combination. Feed your sweet tooth at Churn & Burn, where the coffee can be mixed with ice cream frozen with liquid nitrogen, creating brilliant flavors so good you’ll be back for seconds. If old school waffle cones are your thing, head to College Hill Creamery where, if you choose to, you can add a malt ball flavor of your choice to the bottom of your cone. Chocolate lovers should head to Bradley Fair to hang out in the Cocoa Dolce Artisan Chocolate lounge, where the chocolate runs rich and a side of dessert wine is encouraged. If that’s not enough sweet action for you, try this list of ice cream, bakeries and sweets. Are all these food options making you thirsty? For those over the age of 21, Wichita now offers beer tours with your own designated driver. Brew Wagon Tours is the only local brew bus tour, taking people around to different breweries and driving for them. It’s a safe alternative to exploring Wichita’s brew scene. Check out local favorites like Central Standard Brewing, Aero Plains Brewing, Hopping Gnome Brewing Company, Limestone Beer Co., and Third Place Brewing to get a true taste of Wichita. To expand your exBEERience, try our Beer & Wine Tour. For a complete list of restaurants click here.